While some people drink coffee just to wake up and to focus on the task in hand, for others it is a product to be savoured and appreciated, and offers a wide range of tastes, textures and emotions. We set them a challenge: teach us how to taste a coffee and how to feel a maximum of different subtleties. To start things off, we organized an initial introductory session followed by a sensory analysis session, with the only objective being to evaluate our internal panel quality. This sensory analysis does not aim to lead to an inferential thought. 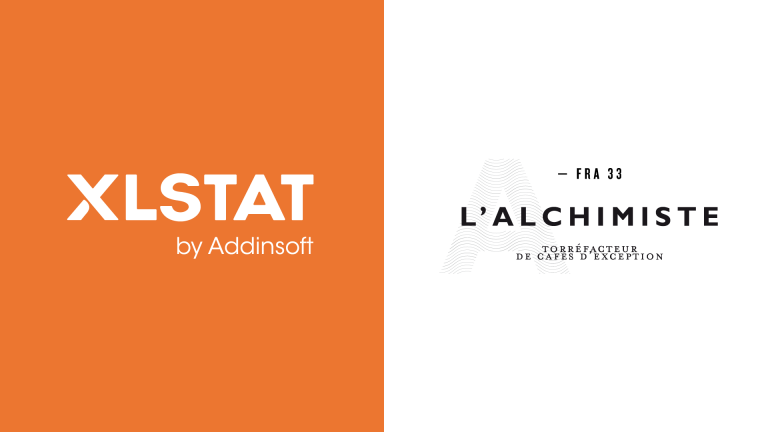 In our case, we analyse a panel of only 20 people, precisely the Addinsoft team. This panel represents a very specific population and therefore we will not extrapolate our conclusions. However, we will able to raise some hypotheses on coffee tasting by beginners. Four different coffees were chosen for the analysis. The idea was that these coffees should cover a wide sensory spectrum, thereby allowing beginners to distinguish between products easily and to provide a varied vocabulary on answering the questionnaire. 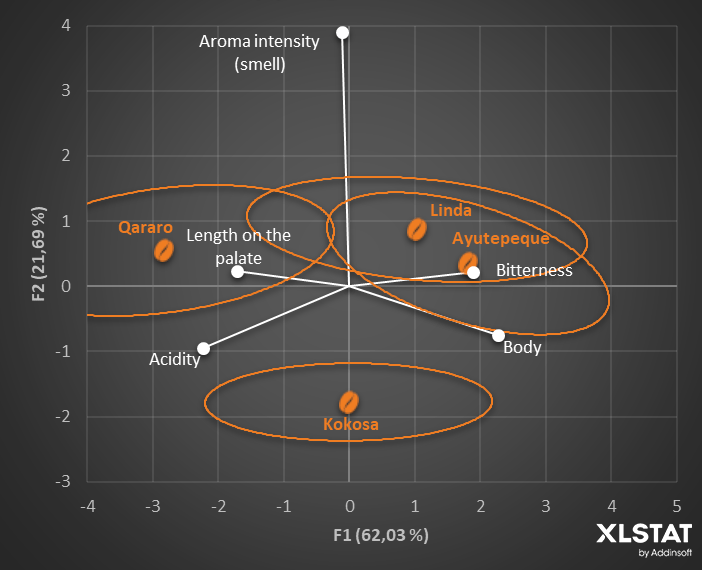 These 4 coffees were tasted by 20 panelists using a sequential monadic procedure (products are tasted one after the other) and based on optimal rotation calculated by XLSTAT. This approach ensures that each coffee is tasted the same number of times in 1st, 2nd, 3rd or 4th position in the rotation, thereby generating a control of this effect for our future analyses. The session was divided into two parts: the first one was a “dry” tasting and consisted of smelling fresh ground coffee, followed by a more traditional tasting of the prepared coffees. The products are presented to the panel using 3-digit codes to ensure that each product remains anonymous. Washed coffee from the Sidama region of Ethiopia. A fruity, complex coffee with apricot and lemon notes. Unwashed coffee from the Guji region of Ethiopia. Fruity coffee with notes of preserved mango and dark chocolate. Brazilian coffee from the Minas gerais region. Full-bodied coffee with hazelnut notes. Coffee from El Salvador with cocoa and blackberry notes. The questionnaire is short: few descriptors were used during the introductory session. We collected two types of data from the questionnaire: a mark based on a 4-point Lickert scale for the descriptors, and text-based data from the open questions asking panelists to briefly express what they felt during the tasting. Let’s begin with the traditional procedure for panel assessment. Even if we can not evaluate its repeatability (the data is the result of a single session), we can assess whether it is possible to distinguish significantly between products. The panelist effect was considered as a random element for the purposes of this analysis. 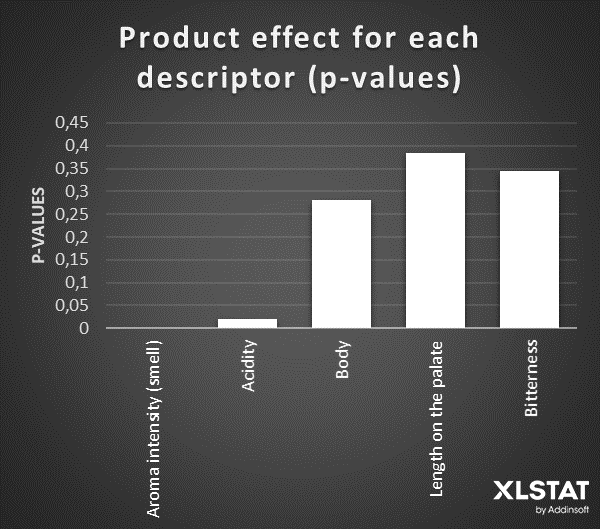 Of particular interest are the Product effect pvalues for the respective ANOVA for each descriptor. If this pvalue is below 5%, it means that we can consider that panelists have significantly distinguished between the different products using this specific descriptor. We can observe that whilst full of enthusiasm, our internal panel is lacking in training. A signification distinction between the products was only made on the basis of two descriptors: intensity of the aroma of beans (smell) and the intensity of acidity (taste). Nevertheless, we observe a very low product effect p-value for the intensity of the aroma of the ground coffee. It is so low that it can hardly be represented on the diagram below. This first observation highlights an interesting point: a panel with no or little training appears to be more able to distinguish between coffees through smell rather than taste. Our dataset takes a bit of a knock... 3 of our 5 initial descriptors didn’t allow us to make a significant distinction between products. There appears to be a certain logic to the distribution of the products in this sensory representation. The bootstrap confidence ellipses are plotted and enable us to moderate our conclusions. Kokosa is a coffee that we perceived as very different from the others, with a lower olfactory intensity. We can consider it as the mean product in terms of the other descriptors. The 3 other products are distributed along the first factorial axis. Qararo, more acidic and longer on the palate, is opposed to Linda and Ayutepeque, which are more bitter and fuller-bodied. In the product description, Linda was described as a full-bodied coffee, so we’re on the right tracks. Note: The olfactory intensity of the aroma is almost confused with the second dimension. It was the most significant descriptor in terms of distinguishing between products and that is why it represents almost 20 % of overall variability of the dataset. All in all, it seems that we were able to perceive some of the subtleties in these different coffees. During the tasting, we also collected the panelists’ opinions of coffees, allowing them to express themselves freely in text form. We then created one word cloud for each coffee in order to see which words were most frequently used (these word clouds should be interpreted with care because even the most frequently occurring words were listed only 4 or 5 times for 20 panelists). For each coffee, we find at least one term used in the product description (chocolate for Ayutepeque, fruity for Kokosa, floral and sweet for Qararo and hazelnut for Linda). It is surprising to find this consistency in terms in such a small, inexperienced panel. Despite our inability to distinguish between products using the sensory descriptors provided, we were able to perceive different subtleties in these products, which demonstrates that anyone can savour a coffee and enjoy different aromas and flavours. For our next tastings, we will need additional training on these descriptors, or to find and select new ones if we want to distinguish more clearly between products. In a coffee shop, it would seem sensible to invite people to smell the ground coffee, enabling them to get a better appreciation of the differences between each product. Everybody is able to appreciate the subtleties of a coffee, it is simply a question of starting!